The Death of the Tax Return! The Chancellor of the Exchequer has delivered his final Budget before the 7th May general election, providing some surprises for savers and confirming further reforms to pensions, plus generous increases in tax allowances. The creation of a new ‘Help to Buy’ ISA is the headline grabber, with first-time buyers to get a £50 top-up from the government for every £200 they save for a deposit to buy a property. A number of measures had been released before the Chancellor made his speech, which we can only assume was to add to the effect of the speech, being the start of the election campaign, and wanting to get the Conservative message out early. The Chancellor made a number of jibes at the Labour front bench during his speech, Ed Miliband’s two kitchens when talking about investment in the “internet of things” and Harriet Harman’s pink van when announcing the reduction in Severn Bridge crossing fees. The speech was very much a political show. A number of the measures announced will not be implemented until 2016 (although two anti-avoidance measures for entrepreneurs’ relief were announced and took effect today). With a general election taking place in May, and at this time there being no sign of a clear winner, how many of the measures announced today will take effect is yet to be seen. We may even have another budget later this year! 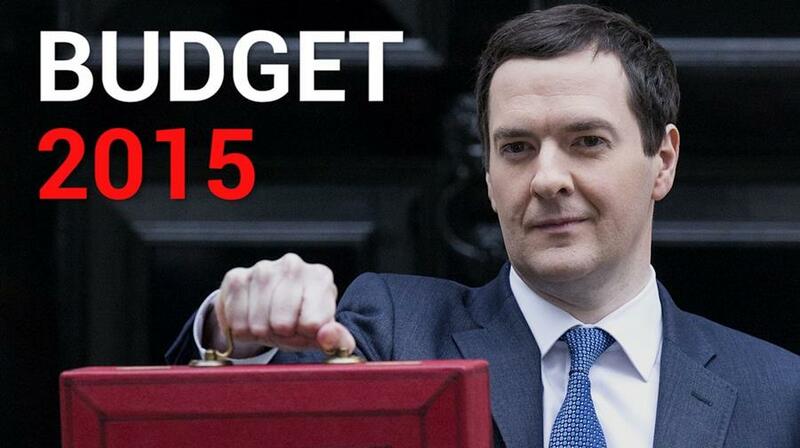 We already have the Liberal Democrats providing their own budget later this week. The Chancellor hopes his savers announcement that “tax should not already be paid on money that has already been taxed”, will win the older voters, whilst the Help to Buy ISA has the same effect on younger voters. We have summarised the major announcements below and will wait to see if these take place – roll on the 7 May! The campaign has started! Personal Allowance Increasing the personal allowance to £10,600 for 2016 had previously been announced. The increase in the allowance will continue to £10,800 in 2016-17 and £11,000 in 2017-18. The age related personal allowance will be removed completely from April 2016. The higher rate threshold (the rate at which you start to pay 40%) – Is increased to £42,385 for the 2016 tax year. For 2016-17 the threshold will be increased £42,700 and the following year £43,300. Married Couples Allowance Transferable tax allowance for married couples to rise to £1,100. Class 2 National Insurance Contributions Will be abolished in the next Parliament (subject to who wins the election), as part of the reforms to tax administration. Farmers From April 2016 the period over which self-employed farmers can average their profits for income tax purposes will be increased from 2 to 5 years. Savings A new personal savings allowance will be introduced from 6 April 2016 to remove tax on up to £1,000 of savings income for basic rate taxpayers (currently taxed at 20%) and up to £500 for higher rate taxpayers. Additional rate taxpayers (45%) will not receive the allowance. ISA’s ISA’s are to be made more flexible later this year, with individuals being able to withdraw and replace money from their cash ISA in year without it counting towards their annual ISA allowance. Help to Buy ISA to be introduced to help first time buyers save a deposit for a home. For every £200 the individual saves the government will provide a £50 bonus up to a maximum of £3,000 on £12,000 of savings. Extending ISA Qualifying Investments – The Government is already looking at peer-to peer loans becoming a qualifying investment, but will look at extending the consultation to include equity offered via crowdfunding platforms. From April 2016 individuals already receiving an income from an annuity can assign the income to a third party or exchange for a lump sum. From April 2015 beneficiaries of individuals who die under the age of 75 with a joint life or guaranteed term annuity will be able to receive any future payments tax free where no payments have been made to the beneficiary before 6 April 2015. Where the individual was over 75, the beneficiary will pay the marginal rate of income tax. The lifetime allowance for pension contributions will be reduced from £1.25million to £1 million from 6 April 2016. Transitional protection for pensions already over £1million will be introduced. Make it part of the qualification criteria that investment is made with the intention to grow and develop a business. Introduce new qualifying criteria to limit relief to companies that started to trade within the previous 12 years. (There is to be an exception to this rules, but at this stage little detail). Cap the total investment a company may receive under EIS and VCT at £15million, or £20million if it can show the business is “knowledge intensive” (still to be defined). From 6 April 2015, remove the requirement that 70% of Seed EIS money must be spent before EIS or VCT funding can be raised. A number of the measures above were made due to EU pressure. The government is to review Entrepreneurs’ Relief to ensure that academics and researchers are appropriately rewarded on the disposal of shares in spin out companies, where currently they may not benefit from Entrepreneurs’ Relief. A couple of anti-avoidance measures have been introduced from today. The first, to deny Entrepreneurs’ Relief to individuals who have got round the 5% shareholding test by holding shares in a ‘joint-venture’ company with no significant trade of its own which in turn holds shares in the ultimate trading company. The second is a measure to prevent individuals claiming the relief on the disposal of personal assets used in the business where they do not dispose of a significant holding of shares (at least 5%) in the Company or the partnership at the same time. There is to be a review of the use of deeds of variation for tax purposes. (A Deed of Variation changes a Will after death and enables the beneficiaries of a deceased’s estate to alter the distribution of that estate or relinquish a bequest. Likely, this was triggered by the news story that the Labour leader used a deed of variation in respect of his late father’s estate. Annual Investment Allowance (“AIA”) The AIA allows companies to claim 100% tax relief on most plant and machinery expenditure in the year it is incurred up to the annual limit. The annual limit has changed regularly since its introduction and was due to reduce to £25,000 in January 2016 from its current level of £500,000. The Chancellor stated during his speech, “I am clear from my conversations with business groups that a reduction to £25,000 would not be remotely acceptable – and so it will be set at a much more generous rate.” However, the new level was not announced and will not be set until the Autumn Statement. R&D Tax Credit This generous relief for companies, which is still being under claimed by smaller companies, is to have measures implemented to improve accessibility, including new guidance aimed specifically at smaller firms. Film Tax Relief An increase in the rate of film tax relief to 25% for all qualifying expenditure from 1 April 2015. In addition, high-end television tax relief (Downton Abbey!) will have a review of the cultural test that programmes have to meet and a reduction in the minimum UK expenditure requirement from 25% to 19% from 1 April 2015.
Business Rates Review A long awaited review of the dated business rates system is to take place after much lobbying. The consultation paper was released on 16th March. Banks Bank levy rate increases to 0.21% (to help with giveaways) and compensation payments made to customers for miss selling will not be tax deductible in calculating taxable profits. Diverted Profits Tax (“Google Tax”) – As a result of a consultation that followed the announcement of the new tax to apply from 1 April 2015, some changes have been made to the draft legislation, in particular around notification requirements. Last Chance Disclosure For Evaders Existing disclosure facilities for tax evaders will close early and a “last chance” disclosure facility will be offered in 2016, with penalties of at least 30% on top of tax owed and interest and no immunity from criminal prosecutions in appropriate cases. The closure of other facilities may be brought forward; for example, the Liechtenstein Disclosure Facility due to close in April 2016, will now close at end of 2015. Persistently Entering Tax Avoidance Schemes Measures will be introduced for those individuals who persistently enter tax avoidance schemes, including measures to publish their names. This tougher stance will also cover the promoters of such schemes. Umbrella Companies & Employment Intermediaries Following a review of travel expenses for workers who are employed via umbrella companies or employment intermediaries, the rules will be changed to restrict tax relief in respect of travel & subsistence claims for workers engaged via those structures. Corporation Tax Losses Measure are to be introduced to prevent companies from obtaining a tax advantage by entering “contrived arrangements to convert brought forward reliefs into more versatile in-year deductions”. From 23rd March 2015, duty rates will be reduced on beer (1p) and sprits and cider (2%). The duty on wine frozen. The fuel duty increase planned for September 2015 is cancelled. Make it easier for individuals to sub-let a room where their lease contains a clause expressly ruling out sub-letting or sharing space. Encourage Local Authorities to use their business rates discretionary relief powers to support the sharing economy. Support to Road Hauliers – There is a shortage of qualified heavy goods vehicles drivers (HGV), which is impacting economic growth. The Government will work the industry to see what measures can be introduced to solve the problem, for example accelerating the training. The big question is whether the Chancellor who announced the measures today, will still be in number 11 to implement these proposals or whether a new Government will scrap them. If you wish to discuss any of the Budget Statement announcements or any other tax matter, please do not hesitate to contact us.